Cathy Conner, a professor of geology in the Department of Natural Sciences, University Alaska Southeast, in Juneau, Alaska, describes teaching about climate change in School in the Cool: Backyard "Lab" Gives Students Firsthand Look at Effects of Climate Change. The article describes the types of measurements students make and how they use those data to investigate climate change. The project involves secondary school students, teachers, undergraduates and graduate students with hands-on experience. 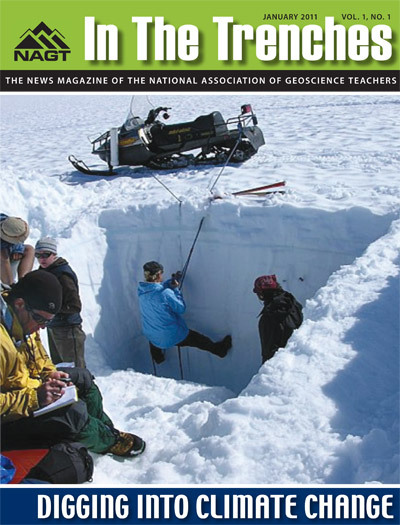 The Experiential Discoveries in Geosciences Education (EDGE) project provides a year of Earth science college courses, geologic field experiences, GIS instruction, and technical support for groups of Alaskan high and middle school teachers and their students. 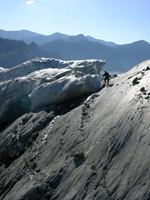 Every summer since 1946, scientists and students with the Juneau Icefield Research Program (JIRP) have lived on and studied the Juneau Icefield in southeast Alaska. For more than two months every summer, 70 to 100 students, professors and research scientists participate in the Institute's programs of education and research. One of the main projects conducted by the program is measuring and monitoring glacier velocities and surface elevation changes using high-precision GPS. Details of this work is available at The Crevasse Zone. South East Alaska MOnitoring Network for Science, Telecommunications, Education, and Research (SEAMONSTER) is a collaborative environmental research program centered at the University of Alaska Southeast in Juneau. In a related article, Susan Buhr, director of the K12 Education and Outreach Program at CIRES (Cooperative Institute for Research in Environmental Sciences) in Boulder, Colorado, discusses Climate Literacy: What It Is and Why It's Important. 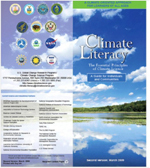 This paper describes the tenets of climate literacy as well as the essential principles of climate science. Such information is critical to educators at all levels. Climate Literacy: The Essential Principles of Climate Science, A Guide for Individuals and Communities: This guide presents important information for individuals and communities to understand Earth's climate, impacts of climate change, and approaches for adapting and mitigating change. On the Cutting Edge Climate and Energy Webinar and Bookclub Series: This monthly series of virtual events will explore the science of energy and climate, along with promising teaching approaches for these topics. The next webinar will be January 21, 2011, and feature Susan Buhr speaking about Misconceptions About Climate Change. The Climate Literacy and Energy Awareness Network (CLEAN) project provides a reviewed collection of resources coupled with the tools to enable an online community to share and discuss teaching about climate and energy science. The NASA Global Climate Change Education initiative is designed to improve the quality of the nation's STEM education and enhance students' and teachers' literacy about global climate and Earth system change from elementary grades to lifelong learners. Intergovernmental Panel on Climate Change, Figures and Tables: This page from the IPCC lists data and figures that were part of the basis of the reports issued by the panel. The Carbon Dioxide Information Analysis Center provides fossil fuel carbon dioxide data by total emissions as well as per capita and teaches students to search for the most recent highest quality data available. NAGT, its members, and its sponsored projects have been engaged in other activities to help improve the teaching of Climate Change in geoscience classes. Teach the Earth is the portal to a large collection of teaching activities and pedagogical materials related to geoscience that have been developed by several dozen projects. SiteGuides are a way of seeing materials on a particular topic regardless of which project developed them. Each Site Guide tackles a particular topic of interest to educators and highlights relevant resources. The Climate Change and Global Warming SiteGuide provides links to general collections of resources, websites and data sets, teaching activities, visualizations, courses, and workshops from various projects. DataSheets concisely describe a particular scientific dataset in a way that is useful to educators interested in teaching with the data set. They highlight the connections between data sets and specific topics in science; they explicate how to acquire the data and include (when available) links to classroom activities that use the data. The DataSheets on the Using Data in the Classroom website are excellent sources of climate data along with information on how to use them in the classroom. The Department of Geosciences anticipates hiring for a tenure-track faculty member at the Assistant Professor level pending budgetary approval, whose professional development is in the area of geoscience education. The area of research in geoscience education is open. This special issue will focus on work being conducted globally in which geoscience education is a means to support human development goals, including universal access to education, elimination of poverty, gender equality, and environmental sustainability. The Submission Deadline has been extended to January 15, 2011 to accommodate more authors. For more information on the issue and contact information for the editors of JGE, see the special issue page. Caltech's Tectonics Observatory is hosting the spring 2011 meeting of the Far Western Section of the NAGT. Field trips and short-course/lecture workshops will introduce participants to recent developments in tectonics, geochemistry, seismology, petrology and geomorphology. CEU's (continuing education units) will be available for participants through USC's Rossier School of Education. For a detailed schedule and application forms, go to http://nagt-fws.org. For more information contact: Jeff Grover (jgrover@cuesta.edu) or Laurie Kovalenko (lauriek@gps.caltech.edu). The North Central Section is making a third attempt at a meeting and field trip this summer (third time's a charm?). We'd like your input about when you can attend. Our dates are from July 18 – August 15. Go to the survey and select times you're available. The results will be compiled by January 31 and the dates and details announced soon after. Then come to beautiful, peaceful west central Wyoming, meet other geoscience educators and share curriculum ideas—all while spending as much time outdoors as possible. A good time will be had by all. For more information, contact: Suki Smaglik (ssmaglik@cwc.edu). NAGT member and Clemson University Emeritus Professor of Geology John R. Wagner received the South Carolina Science Council's highest award for a science educator on November 5, 2010, at the council's annual convention. The Catalyst Award for Educational Excellence is presented each year to a science educator who has made a significant difference in the way science is taught in South Carolina. Wagner was honored for his work in several K-12 curriculum development projects for the Earth and environmental sciences, in particular the SC MAPS and SE MAPS programs, and for years of providing exemplary professional development opportunities for teachers through graduate courses, workshops and field experiences. The South Carolina Science Council, a chapter of the NAGT, boasts over 2,000 members from South Carolina's K12 and higher-education science teaching community. Two workshop opportunities have application deadlines coming up in January. Both Visualizing Seismic Waves for Teaching and Research and Designing GIS and Remote Sensing Courses, Modules, and Activities for Teaching Geoscience Students have application deadlines of January 15, 2011. Both workshops will be a combination of face-to-face meetings and virtual sessions. Check out the individual workshop websites for more information. Pursuing an Academic Career in the Geosciences begins in January as well. This series of virtual events for grad students and post-docs offers resources for and insights into effective teaching, career planning, the job search, and learning more about faculty positions in different types of institutions. Register for one or more sessions via the event webpage. The next Climate and Energy Webinar will be January 21, 2011, featuring Susan Buhr speaking about Misconceptions About Climate Change. Space is limited, so be sure to register prior to the event via the webinar page. Each year, NAGT makes several $500 awards to undergraduate students to facilitate their study of field geoscience. These awards, previously given to students who attend a traditional summer field camp, are now available for students attending field-based courses at any time of year. For more information about the award and application instructions, see the program webpage. The Geoscience Teachers in Parks (GTIP) program is a collaborative effort between NAGT and the National Park Service to provide professional development for K12 teachers of geoscience. Two teachers will be selected for internships at Mammoth Cave National Park in Kentucky. For more information and application instructions, see the program webpage. The European Geoscience Union 2011 General Assembly will be held in Vienna, Austria, April 3-8. There is one education-related session on the program: New, Original and Successful Ideas for Teaching Earth Sciences/EOS. Follow the link to learn more about the session and to submit an abstract. Deadline for abstract submission is January 10, 2011, 24:00.